Le Club Accorhotels has launched new Novotel promotion for stays in Belgium, Netherlands and Luxembourg between June 1 – July 31, 2015 (book between May 11 – June 14). Le Club Accorhotels can earn 500 bonus points for one night stay and 1,000 bonus points for a stay of two nights. This offer requires you to boon “Early Breaks” or “City Breaks” rate offer in order to earn the bonus Le Club Accorhotels points. The terms and conditions state that you could only earn the bonus points once during the offer period. 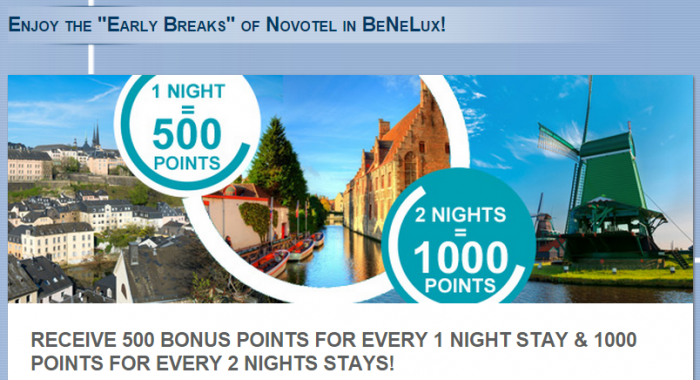 Nice bonus points promotion for Novotel stays in Benelux. You do have to book this offer in advance, however. 1. General Le Club Accorhotels terms and conditions apply to the “Novotel-Early Breaks BeNeLux” offer. 2. This offer is valid for bookings made 21 days in advance with the “Early Breaks” rate (or “City Breaks” if the previous one doesn’t appear) between 11/05/2015 and 14/06/2015 in one of the 20 participating Novotel hotels in Belgium, Luxembourg & the Netherlands for stays between 01/06/2015 to 31/07/2015. 3. This offer entitles Le Club Accorhotels Loyalty members, regardless of their status, to benefit from earning 500 bonus points for each 1 night stay & 1000 bonus points for each 2 nights stay, with breakfast included thanks to the special “Early Breaks” rate of Novotel. 11. The Le Club Accorhotels members can only benefit once from this offer during the validity period.